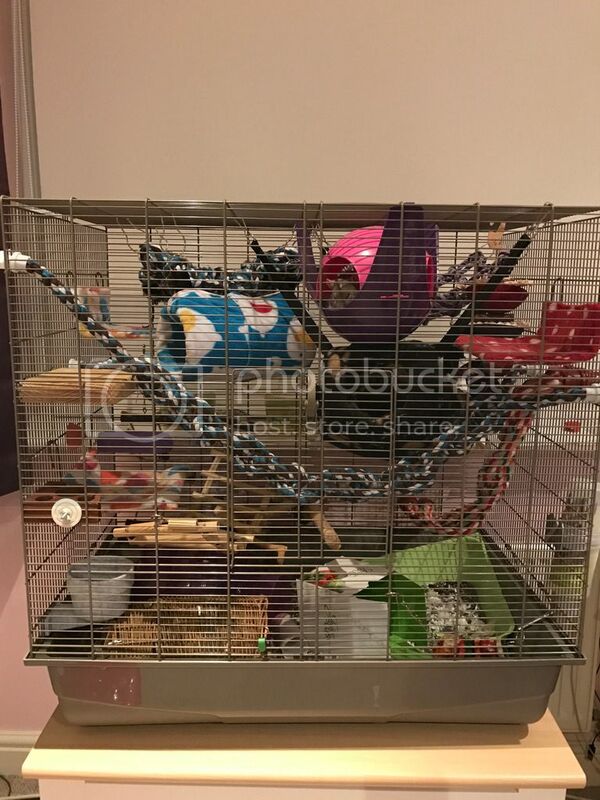 My daughter has the Freddy Max 2 cage in which we have taken all the shelves out and added ropes etc to give the rats more exercise and stimulation (picture attached). She is wanting to add more rats now that her two boys are a year old as she does not want one to be left on its own when one dies. The question is what is the best age for her existing rats to be to have new roommates?And secondly would her cage accommodate 2 new baby rats as I have also heard that you are best to add two new rats of the same age instead of a single so that they have a playmate of the same age? If the existing rats are 12 months old, I would recommend getting 2 youngsters, of around 12 weeks old. That should (?) ease introductions and the youngsters will have same age company. I would follow the carrier method for introductions though. I agree - 2 or 3 babies will be fine to add as soon as you like. Introduce them using the carrier method. If we decide to wait until the summer holidays when they are a year and a half is that still an okay age to introduce babies? Yes, they should be fine at any age. I prefer rats to always live in groups of at least three though, so personally I'd introduce sooner so that your older boys have more variety in terms of their relationships for longer. cyber ratty wrote: I agree - 2 or 3 babies will be fine to add as soon as you like. Introduce them using the carrier method.